The District’s treatment plan uses a two stage biofiltration process followed by ammonia removal and filtration. Before discharge the treated sewage is chlorinated to kill bacteria and then dechlorinated to remove the chlorine toxicity. 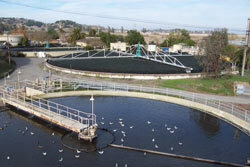 The solids removed by the process are digested by organisms that feed on organic matter in the sewage. The methane gas produced by the digesters is used in an engine generator to produce electricity, and the waste heat from this cogeneration is recovered to heat the digester.